I hope everyone had a great New years! Hello 2012! I am so honored, humbled, and happy to receive my first award from the Society of illustrators here in NYC. The opening show will be this Friday night, and hope to see some of you there. Happy 2012! 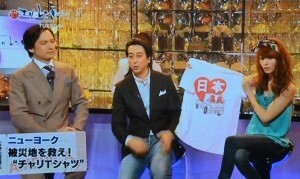 NHK’s new show ” El Mundo” featured the artists who contributed to Hearts To Japan T-shirt designs for donations to Japan. I was so honored to be featured and have my shirt shown on the show. I will try to post a video of it when I can. I hope many people BUY some of the artist’s great designs and the donations for my second home of Japan continue for the many tough days ahead. Ganbate Japan! Tonight (4/10) is the opening for a wonderful exhibit and charity event I was honored to be a part of. 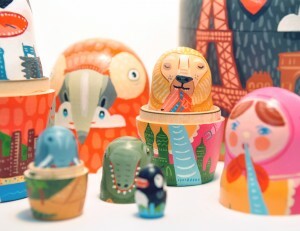 Spur Design in Baltimore is having an opening tonight for “100 Heads for Haiti” . If you are in Baltimore please stop by. 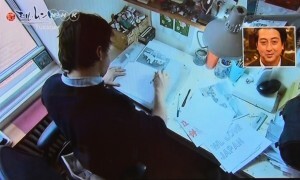 I wish I could make the show! Jon & Kate plus me? 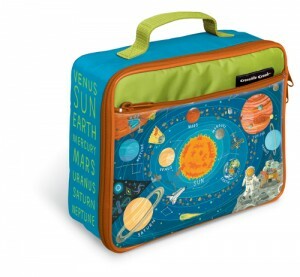 Some of my lunchboxes and bags I worked on with Crocodile Creek were seriously featured on Jon & Kate plus 8 yesterday. I think they bought every lunchbox Crocodile Creek makes. My solar system and vehicle artwork as well as some of the awesome art by my other friends were on the show. Here is a link to the action! I’m excited to take part in an auction set up by Design Within Reach and Housing Works on July 23 at the DWR: Tools for Living store in Soho, nyc. 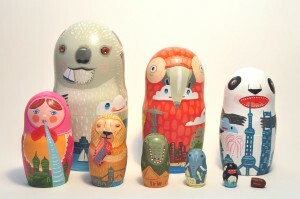 It was challenging and so inspirational to paint 12 nesting dolls for a great cause. Check out some more info HERE! 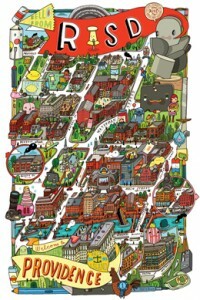 risd|works has my RISD Campus print available for sale on their site. If you are ever in lovely Providence, Rhode Island, check out their amazing shop and new location. 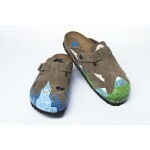 At risd|works all items are designed and made by Rhode Island School of Design (RISD) alumni and faculty! 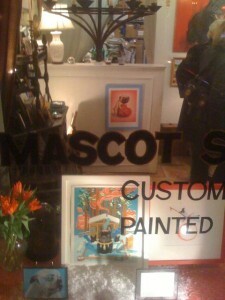 Mascot Studio ( 328 E. 9th st, NYC) is having their 10th Annual Dog Show. 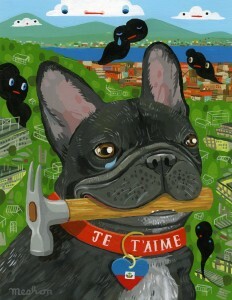 The show features Dog inspired art from myself, Chris Buzelli, Peter McCaffrey, Anne Watkins and more! If you are in the East Village stop by and say hi to Peter and check out the work. 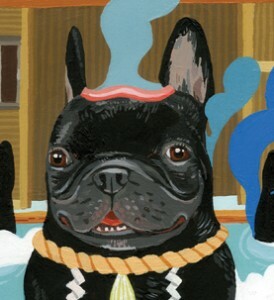 I have been working on a new series of dog pieces that I’ll show later in the year! Happy 2009 everyone. I hope everyone’s year is off to a good and healthy start. I just got back from 2 weeks in Japan. It was amazing. Be sure to stay tuned to some new inspired work. 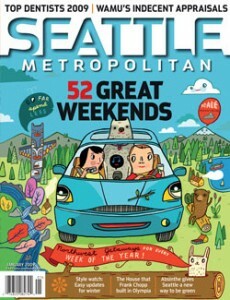 I am also excited to have just completed this cover for Seattle Metropolitan magazine. I love the Pacific Northwest and hope to visit there again soon.